Slurping this garlic and ginger-spiked broth, earthy with dried shiitake mushrooms, takes me back to Japan. I have been fortunate to have twice-visited this captivating country, enjoying food in both a Michelin-starred, dream-like setting and, more commonly, family cafes, hunched at the counter, shoulder to shoulder with shop workers and students. The one thing in common: broth. Hot, steamy, silky broth. At Daigo, sitting cross-legged in our private dining room with our hosts, overlooking the beautifully-lit garden, Andrew and I enjoyed a succession of exquisite, vegan kaiseki dishes, each more intricate yet simple than the last. Where the previous tidbits were quite baffling to us as to how to “tackle” them, soup, a unifying dish in any language or culture, was easy. The opaque, earth-red broth, with the tiniest, tastiest morsels, was meant to be picked up and slurped. It was so unutterably delicious that I sat with the carved cup poised at my lips, just letting the savoury liquid trickle into my belly, expanding its warmth to the whole of my being. It was quite spiritual. The whole meal was one that I can’t imagine ever forgetting. The company of our two charming Japanese hosts, the elevated tea house setting near the foot of Mt Atago, the breathtaking food and presentation, the attentive, kind service by kimonoed staff. We were even escorted down the moonlit hill by men with flickering lamps. I felt like a princess. Contrast this to the second-wettest day of our trip. After a morning spent dotting in and out of quirky shops in the textile district, our umbrellas and extremely dodgy-looking (read: completely see through) rain jackets getting properly baptised in the approaching monsoon, we stopped for lunch. Well, not so much stopped for as hunted for. We had read about a cafe that served what some considered to be the best ramen in Tokyo. 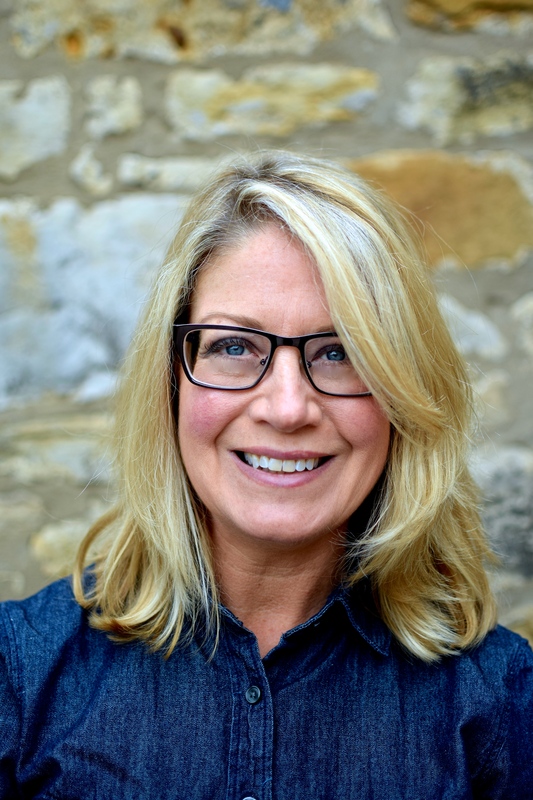 After walking past its door, oh at least six times, circling around in the pouring rain, we entered dripping, my glasses immediately steaming up. Once cleared, I could see that this was a pretty interesting little joint. With the look of a small, very plain American diner of old, it was completely filled with people holding steaming bowls of soups, some noodley, others with dumplings. Lots of enthusiastic slurping. Baffling to us, there was no obvious way to order food. No menus. No servers. Just white-jacketed chaps viewed over the large open hatch, pulling noodles and filling bowls. Then we turned and saw the hulking vending machine. Looking like a repurposed cigarette machine rather than the ubiquitous pavement-side drinks vendies, it was sequentially numbered, had Yen prices, and only a few descriptive Japanese characters at each button. As we were not in a tourist area there were no helpful pictures. We eventually fathomed that if we pushed a button and shoved in the requisite monies a ticket would be dispensed. Feeling brave, but also knowing that nothing really bad would happen, we pressed two higher priced buttons, two lower priced ones and buttons we rationally assumed were drinks. We took the tickets to the brightly-light hatch and grabbed the only seats left, right there at the hatch itself, waiting to see what on God’s earth we had actually ordered. We knew it would be soupy. And delicious. But by the variety of bowls around us knew that we were really ordering blind. Most of our meals involved some kind of nourishing, brothy concoction – including breakfast. On the basis of that alone I could happily live in Japan if it meant that broths all day, every day, was an actual thing. With that in mind I have been playing with getting to grips with my own fragrant, Japanese-influenced broth. I have had this particular one for both lunch and breakfast, adding in a soft, halved, very messy egg to the latter to feel more breakfasty. But I prefer the purity of the way I have it here for you today: just a scattering of thinly-cut vegetables and juicy, bought Japanese dumplings. I think I prefer these gyozas in broth rather than drizzled in sauce as an appetiser. And I find them much easier to grab than noodles. But if you prefer to go with noodles, you do you. Oh gosh, this is ripe for tweaking, isn’t it? Go crazy! Although dried shiitake are the backbone to the soup, if these are hard to get hold of, follow my Pho recipe for the stock (the shiitake in it are optional) and come back here for the veggies and gyoza add-ins. If you aren’t crazy about mushrooms, use a good lower sodium vegetable broth (bought or recipe) and add the miso and mirin as directed, as well as the other ingredients. Or, go the other direction and amp up the mushroom goodness by stirring in a tablespoon of mushroom powder – chaga (although Siberian in origin) is a super choice, with a mild sweetness. As for the vegetables, use whatever is seasonal or easily bought. In summer, I would go for thin asparagus and disks of summer squash. Use noodles instead of gyoza. It is the cheaper option and just as nice, but different of course. Add protein. I’ve deliberately kept this super light, but add in a few cooked prawns, a handful of edamame beans, leftover meat or chicken if that’s your thing, or a halved, soft-boiled egg. Toasted sesame oil isn’t traditional for this kind of thing but I really like it. Lime, too. Need the broth to give more of a slap than hug? Add chilli flakes or nose-watering sliced red chillies. This will turn your comforting, nurturing bowl of soup into a one-two punch on any lurking virus. Did you know that the word shiitake is derived from the Japanese word for mushroom – “take” and the word “shii”, which is Japanese for the type of chestnut tree where shiitake naturally grow? No, me neither. Shiitake are a great source of selenium, pantothenic acid, Vitamins B-2 ,B-6 , zinc and copper. But it is the lesser-known and newly discovered compounds that this special mushroom contains that make it really worth including more often in your meals. And by eating only a small amount. They contain molecules that measurably lower blood levels of a number of inflammation markers (the latter of which we almost always want lowered). They also contain a form of polysaccharides known as beta-glucans that have multiple, health-promoting functions, including acting as antioxidants, and directly supporting digestive, endocrine and immune functions. And if that wasn’t good enough, beta-glucans – and therefore shiitake mushrooms – help regulate blood sugar levels and insulin response. What ways do you enjoy shiitake mushrooms? Haver you ever been to Japan? How did you like the food? Did you fall in love with soup and broth all over again? **Remember to follow me on Pinterest and, if you make my Shiitake-Ginger Broth, click on the pin below the recipe card and leave a photo of your make with a comment telling me what you think, or any awesome changes that you made. Similarly, any Instagram posts tagged @food_to_glow using my recipes will go on my Story if I see them. I’m always so proud when you share my recipes with the world. Yay!!! 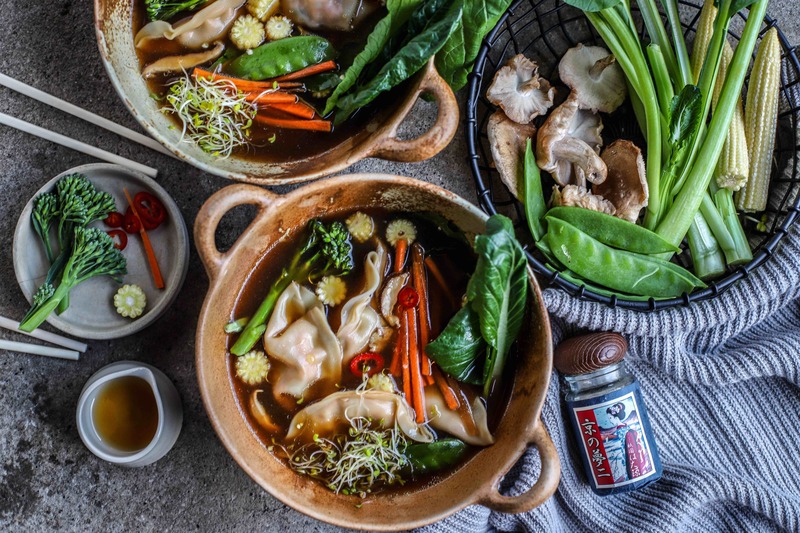 This Shiitake-Ginger Broth is light and deeply-nutritious, floating just a whisper of thinly-cut vegetables and a few juicy gyozas. The perfect antidote to heavy winter food. Heat the oil in a medium saucepan and add the onion. Saute for five minutes over a medium heat, stirring frequently. Cook until golden and fragrant. Add the remaining broth ingredients, except the miso, and bring to the boil. Simmer hard for half an hour then strain - it will have reduced to about 700ml by now. Press the cooked bits with a spoon to extract all the goodness. Taste and whisk in the miso and any other elements that you think it needs - more soy, mirin or more pepper. Add the gyozas now and cook gently just until done - about three minutes. While the broth is simmering, saute the fresh mushrooms in oil until cooked through. Add the choi sum, broccoli, mangetout, carrots, corn and red chilli to each serving bowl. Ladle over the broth and gyozas. Top with the sprouts, sesame oil and little lime juice if you wish. Eat hot or warm. This is delicious medicine in a bowl. I feel better just reading about it!!!! What a SOUP! I could eat this right now. Love how so many cuisines have their own spin on a dumpling soup. This looks divine and your trip sounded just as wonderful. Should hit you up for recs whenever we plan a trip to Japan. What a wonderfully evocative post and recipe, it makes me long to be back in Japan. Your broth sounds exquisite, I will try it for sure. Love this soup, Kellie, but I do make it with soba noodles – too lazy to make gyoza, I guess. Happy holidays to you and yours! Overused phrase I know buy my mouth is watering reading this. A great one for over Christmas when all the family are here (vegan and non-vegan).